Sandman Overture, like all the Sandman stories is a wonderful collaboration between Gaiman as author and the artists and comic professionals who bring the story to life and give it the distinctive visual vibrancy and immediacy one has come to expect from the series. Indeed, despite my great admiration for a lot of Gaiman’s work, were it not for the artistic input from his collaborators this 6 volume story would have lacked a lot of its punch. If you are already familiar with The Sandman you can skip this paragraph. The central character of the series is Dream, one of the Endless. The Endless are the anthropomorphised expressions of abstract ideals that through their existence define the universe. Destiny, Death, Destruction, Dream, Desire, Despair, and Delirium. Each of the Endless are immortal, for a given value of immortal, and each has enormous power, especially within their sphere of influence. For Dream, that sphere is, of course, dreams, but more than that, it encompasses fiction, stories, narratives of all sorts, and, to a certain extent, reality. Because by defining the unreal we know that the real exists as all else. The Sandman series officially ran from January 1989 to March 1996, and was followed by anthology editions, and several spin-offs and related titles. Sandman Overture is a prequel (what is with the popularity of prequels these days? Are we so afraid of moving on that we want more of the same?) and focuses on the events that immediately precede the opening of the first issue of The Sandman or the opening chapter of Preludes and Nocturnes. So essentially it tells the story of what weakened the character of Dream so much that he could be caught in the spell of the Victorian occultist Burgess that began the series back in 1989. Throughout its pages it drops hints and mini-reveals that add resonance to the main series, and, to some extent, explore the relationships of the Endless. It is an essential purchase for The Sandman completist or collector, but in many respects it is a bit of a let-down. Given Gaiman’s great strength as a short story author, and his command of this material, this universe, and this character, I have to admit that my expectations were high. Perhaps too high. Gaiman’s Sandman has never been afraid to eschew standard narrative conventions and a fair number of issues have been as experimental as any modernist novel, so it is somewhat disappointing that the story presented here, despite appearances, it actually fairly pedestrian and prosaic. The plodding travelogue, barely spiced up by exotic locales, moves inexorably toward a climatic finish that is robbed of power through the use of a plot device already seen in the main series, a deus ex machina, and, reader foreknowledge of the outcome… it is a prequel after-all. We already know that Dream wins out, albeit in a weakened state, so much of interest is in how he wins out… which, unfortunately, is why the already used and heavily foreshadowed plot device and the deus ex machina are so disappointing. To be fair to Gaiman, in many respects his hands were tied about what he wanted to do with this story. It had to fit existing continuity, it had to end a certain way, and, if he wanted to please fans, it had to contain nods and cameos of certain characters and story elements. No matter how high he wanted to raise the stakes, no matter how cataclysmic he made the challenge to Dream, the story was still going to end up in the same place. This is, unfortunately, one of the major problems with many prequels, particularly those set just before the events of a well-established series. So it is hard to fault Gaiman here, as there was little he could do about this particular aspect. Therefore, unless you have almost no knowledge of the main series, there is very little dramatic tension present, at best there is some curiosity. But, if you have no knowledge of the main series, much of the detail, context and required knowledge for unpacking the story is absent as few characters are explained, few relationships are actively detailed, and context is a thing left far, far behind. This lack of context for readers unfamiliar with the main series makes the story fragmented and disjointed, full of characters who appear and disappear without meaning or context, and therefore it doesn’t really function as an entry to the main series. So for the un-initiated it paradoxically appears to be both a simplistically linear travelogue and a strangely broken and nonsensical journey that lacks context. For the initiated it is both a strangely pedestrian story, and delightfully insightful in regards to the storyworld, as it caters to the encyclopaedic need to know more about the world, and yet moves inexorably to a known conclusion. It really is a case of damned if you do, damned if you don’t. However, for those familiar with the series there are lots of details and nuggets of information and context revealed in this volume that will probably make you want to re-read the whole series from start to finish yet again. This is definitely a volume that is an addition to the main series, rather than a stand-alone story. Small moments in this story are deliberate nods and developments (or pre-echoes, as it is a prequel) of moments and character revelations in the main series. The story itself is the expanded version of something actually referred to in the main series, giving a feeling of deepening the diegetic reality and building the world and universe out deeper and wider. Yet… and yet… the story remains deeply underwhelming, bland and prosaic. Where the main series followed Dream on a gigantic character arc that fleshed out his character and revealed his fatal flaws, and it jumped around backwards and forwards through his timeline letting us see multiple aspects of Dream, this is a fairly static portrayal of the character, locked in the least sympathetic aspects of his personality. The emotional resonance of the main series is missing, primarily because you cannot deliver the same impact in six issues that you did over a long running series. 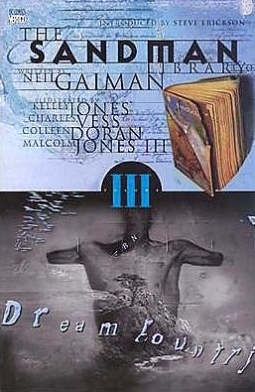 But while many of the individual issues of the main series focused on the stories of other people with Dream as a character in them, this focuses almost solely on Dream, and as a result adds information and background, rather than depth to his character, because Gaiman cannot change him here, his future is already set. This lacks the style and power of stories like ‘Ramadan’, or the historical meta-commentary found in ‘A Midsummer Night’s Dream’, it lacks the narrative cohesion of The Dream Hunters and seems more like the fragmentary stories of Endless Nights without the framing of a story anthology. It is burdened with the need to live up to an epic story cycle and to do so in only 6 issues whilst touching on cameos and appearances that will delight fans of the series, and it is just a shame that it does so at the expense of the story. Perhaps one of the most damning aspects of the whole story is that it reduces Dream’s main series arc into one of simple predestination devoid of freewill and character growth. A ramification that may or may not have been intended. Certainly, it was an aspect of the main series that inspired debate and posed the question about inevitability created by decision, and inevitability created by fate. However, in this volume, Gaiman comes down heavily on the pre-ordained, fate aspect, and therefore robs Dream’s character of agency and freewill in the main series. This might not be a big deal to some, but to me this diminishes Dream as a tragic figure and turns him into an empty puppet. But the comic is collaborative effort, and it is the artwork that really sells this volume and makes it worthwhile. JH Williams III along with Dave Stewart present the reader with intricate, varied, and stunning pages and panels, that run the gamut of artistic styles. You will be hard pressed to find a single page that exemplifies the book, except in terms of quality. The book really does look gorgeous and it leaves you wanting a massively oversized version so that you can really take in all the detail. While some of the pages and panel organisations cause you to rotate and spin the book in your hands, trying to puzzle them out, other are simply visual feasts that your eyes can devour again and again. So many of the pages play with lay-out, panel design, and eye-tracking, to make you look, read, and look again. This book is worth the purchase price for the artwork alone. This is a book that engages the eyes, that challenges the brain, and that makes you pore over every page to take in the detail and sumptuous colour. In summary, unless you are already a committed fan and collector of all things Sandman or you are a fan of beautiful artwork , this isn’t a great graphic novel. But if you love artwork, if you love The Sandman then I am assuming you have already bought this and added it to your collection and won’t care about this review.